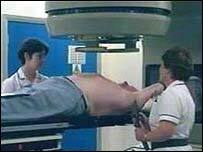 BBC NEWS | Health | What is radiotherapy? It has long been known that radiation can damage human cells - and radiotherapy harnesses that power to treat cancers. Ionizing radiation - similar to x-rays - can penetrate tissue, and alter the part of the cell which regulates its growth and reproduction. There are two types of radiotherapy - delivered from outside the body by a machine, and using radioactive implants placed inside the body. Researchers are working to increase the effectiveness of radiotherapy by targeting the beam of energy more precisely, and making the cancer cells more sensitive to it. The principal use of radiotherapy is to tackle solid tumours found in just one location, for example skin, brain, breast or uterine cancers. Sometimes doctors will use the treatment to shrink a tumour so that a subsequent operation will be more effective. In some cases, for example in invasive bladder cancer, radiotherapy is considered as the first option, as an alternative to surgery that would have permanent effects on the lifestyle of the patient. But although radiotherapy alone can cure many cancers, in other cases the radiotherapy is given after surgery over the surrounding area to "mop up" any remaining cells which have spread from the original cancer site. If there is a suspicion or firm evidence that cells could have spread further afield, then chemotherapy may be the preferred option. If the radiotherapy is delivered by a machine, then the patient will normally be given repeated treatments over a brief period. Although treatment timing varies depending on the type of cancer, its location, size, and the dose chosen by the doctors, it is not unusual to be given treatments every day for a few weeks. If the therapy involves inserting a radioactive implant near a tumour, then a brief hospital stay is normally needed. Although the treatment itself is painless at the time, the culmulative effect of many sessions does produce side effects. The radiation can produce a sunburn-like effect on the skin as it passes through. The extent of this depends on the number and intensity of treatments. There can be hair loss in the area being treated - which is usually temporary. The treatment can also leave the patient feeling fatigued and generally lethargic. There may also be specific side-effects associated with radiotherapy administered to specific parts of the body. For instance, radiotherapy to the pelvic region can trigger diarrhoea and cystitis, while radiotherapy in the abdomen can lead to nausea and vomiting. Ionizing radiation produces changes within the genetic structure of the body's cells, and there is a small risk that an increased radiation dose leads to changes in healthy cells which can cause cancer. However, the dose is lessening steadily as modern radiotherapy equipment targets tumours more precisely. The risks of medical radiation exposure are miniscule when compared to the risks to the patient's health of not having the treatment. Older radiotherapy equipment tends to give the patient a slightly higher dose, but the UK government is now investing in the latest machines. What's likely to happen in the future? Researchers are fine-tuning radiotherapy to improve the outcomes for patients. The main efforts focus on delivering a more powerful radiotherapy beam accurately to smaller and smaller targets. Some drugs seem to make cancer cells more vulnerable to radiation, which means less powerful radiotherapy, or fewer sessions, are needed. Another field of research is looking at heating cells in a specific area to make them more sensitive to radiotherapy.